Long before the invention of wifi and the frappuccino, the coffee shop established itself as the place to meet and swap ideas, strike deals and exchange business. It’s moved on significantly since its inception in the 16th century, but to date, the coffee shop remains a curious intersection of work and social space. It was the financial crisis of the late 2000s that took coffee shop culture and turned it on its head, as a wave of freelancers and start-ups looked for flexible work spaces to house their fledgling businesses. Fed on a diet of caffeine, free wifi and social-interaction, the co-working space was born. There are now 600,000 more micro-businesses than in 2008 in the UK alone; companies too big for the coffee table but too small for conventional corporate spaces. Co-working offices have become the favoured solution for millions of entrepreneurs across the globe. Popular in the US – where the term was coined by Brad Neufeld in 2005 – London, Berlin, and Tel Aviv, the co-working trend is gathering pace and setting new real estate agendas. Here, we dissect the anatomy of co-working culture. Cubicles and corridors are a thing of the past. Step inside London’s Second Home, for example, and there’s barely a wall in sight. Instead, sweeping acrylic curves define workspaces, giving way to ‘roaming zones’ – shared spaces that foster interaction. ‘We believe in something simple,’ says Second Home co-founder, Rohan Silva. ‘Good things happen when people and businesses collide.’ To mastermind this collision, Second Home enlisted Spanish practice SeglasCano – designers of this year’s Serpentine Pavilion – who created fluid and flexible spaces, brought to life with over 1000 plants. ‘Home’ was a canny choice of name by Silva and co. Today’s best co-working spaces are conceived as just that – places people would happily live in. And it’s the little touches of domesticity that make the difference, from international group WeWork’s pro-pet policy to UK outfit The Office Group’s carefully curated library of coffee table tomes. 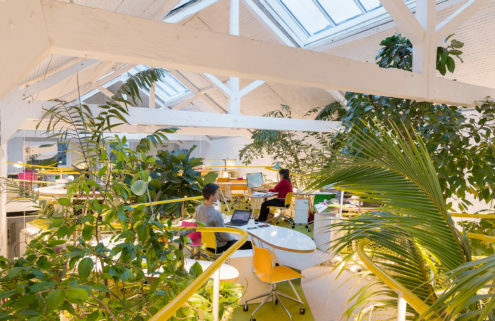 Shared work spaces have moved on from the ‘office-as-a-playpen’ mentality that triggered kitsch HQs for the likes of Innocent, Coca Cola and Google in the noughties. These are sophisticated spaces that boost well-being – and that you would proudly call home. No where is this more evident than at private work collective, NeueHouse. 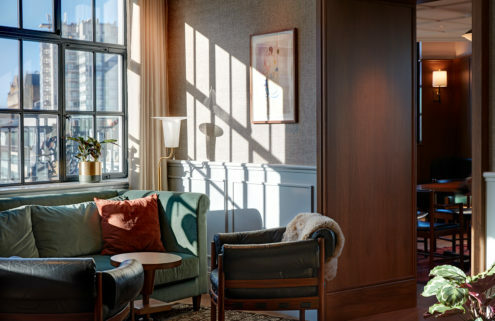 Its designer, David Rockwell says their New York space echoes the experience of a fine hotel, and ‘privileges spontaneity and movement’. The group will soon open an outpost in LA’s historic Columbia Square CBS Radio Building, and a 66,000 sq ft space in The Adelphi Building just off London’s Strand in early 2016. Inside Neuehouse’s private work collective space in New York, designed by David Rockwell. Cafes, bars and restaurants (often helmed by top chefs) are now regularly on the menu at the best co-working spaces. ‘Fundamentally, we believe we’re in the hospitality industry,’ says The Office Group’s co-founder Charlie Green. ‘That’s about creating the right environment and, once people are in it, looking after them’. Gigs, events, exhibitions and talk programmes are also staples of the co-working hub. NeueHouse even offers meditation rooms and yoga classes to soothe members’ chakras. Often these spaces are geared to a particular industry, such as the Traveltech Lab from London & Partners and The Trampery, which creates a rich knowledge pool for young businesses. And co-working giants now offer an arsenal of intranets and networking apps to join the dots further still. 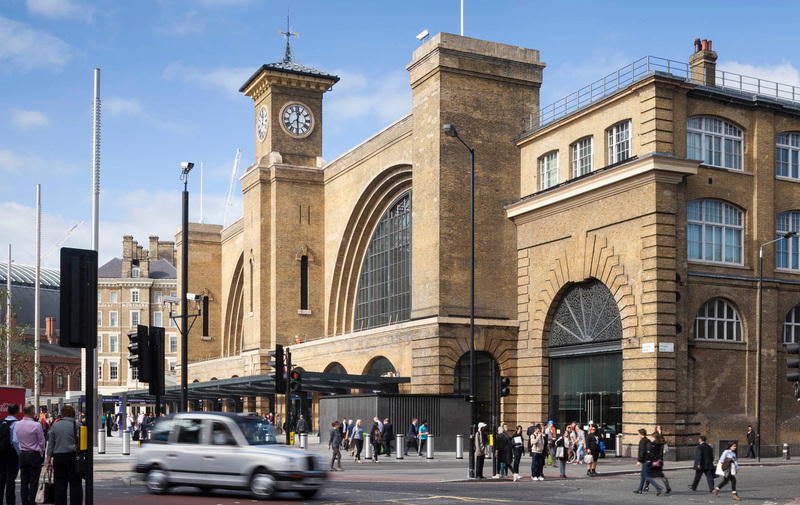 The Office Group have co-working spaces in King’s Cross (pictured), Marylebone and Euston, among other locations. In London, for example, shared office spaces naturally began springing up around Tech City in Old Street, as well as commuter hot-spots like London Bridge, drawn by proximity to established businesses and transport interchanges. But, with co-working spaces now offering their own mini ecosystems, they can sustain themselves as micro economies in less obvious locales. ‘We’re seeing people wanting to push out into areas that, previously, you wouldn’t even want to go,’ says Green. Co-working hubs can thrive before infrastructure arrives on site, helping to attract other businesses to an area and increase its desirability. London’s Queen Elizabeth II Park is a case in point. Here, the influx of co-working clubs are accelerating its post-Olympic maturation, creating fresh village communities. ‘It’s the clearest change we’ve seen in the last twelve years, this desire for community. People will travel for it,’ Green explains. Over in Detroit, co-working ventures could be the key to kickstarting the city’s flat economy: ‘Five years ago there were few if any co-working space at all,’ says Amanda Lewan, co-founder of Bamboo Detroit space. ‘Today we estimate 12 or 13 within Detroit city limits, and more in the metro Detroit area.’ Stocked with tech-startups and young entrepreneurs, they’re drawing young professionals back to the city while carving out a space for new industries in Motor City. 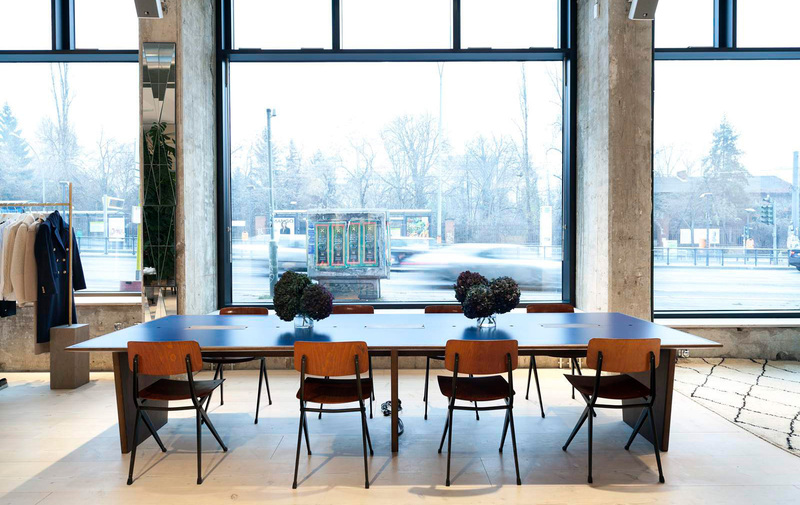 The Store x Soho House Berlin’s co-working space is set to open in April 2015. Hotels are now getting in on the co-working game, offering informal spaces for collaboration. 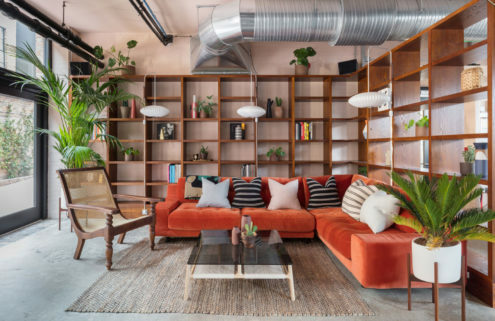 US group Ace Hotel raised the stakes with its Shoreditch outpost, with desk spaces on the ground floor that quickly became a magnet for East London media types. It’s a formula they will repeat in their Pittsburg hotel, opening in late 2015. Going to work never seemed so appealing. When Alex Eagle opened The Store in the private members’ club’s Bauhaus building earlier this year, she redefined what that humble word could mean. ‘We wanted to create an urban oasis,’ says the creative director, ‘somewhere that people can spend their entire day’. A destination to shop, eat, play and grab a haircut, it will soon include work spaces – opening in late Spring. Visitors will also be able to flick through a selection of beautiful books and take in an art installation in between client meetings. 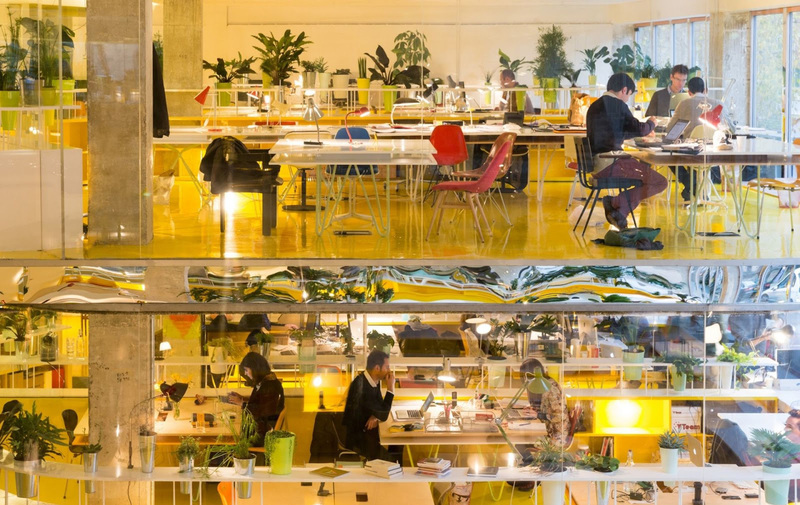 Spanish architecture practice Segascano transformed a former carpet factory into a new co-working club, using curving acrylic walls lined with plants. Beyond workspaces, the building hosts live music, lectures and film screenings. Ottolenghi’s former head chef Louis Solley runs the in-house restaurant. The Office Group’s latest venture opened to the public in March. 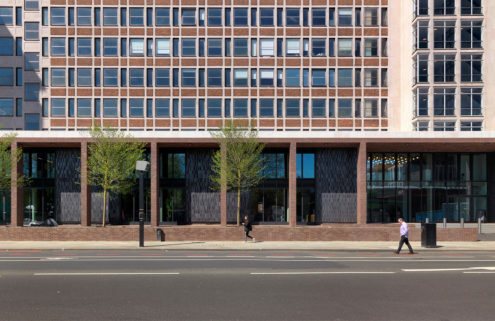 A former 1960s BBC building has been given a mid-century-style make-over by design studio Buckley Gray Yeoman. The finishing touches are being applied in the form of a ground-floor cafe/bar. Mega-players WeWork are one of the fastest expanding co-working providers, but each of their spaces is unique. Their Empire State space boasts a central location, recording studio, honesty market and even a meditation room. WeWork is also spreading its wings to Europe, with spaces in London, Amsterdam and various locations in Israel. They made the news recently when they announced they were opening shop in the Adelphi Building off London’s Strand in 2016, but it all started in New York for these guys. This spring, they’re opening up their second private work collective space in LA, designed by David Rockwell to cater for their jet-set members working in the creative industries. Social enterprise The Trampery’s flagship space is a refurbished 1960s office block with 50 desk spaces, a ground-floor gallery, events space and restaurant. Carpets and polystyrene ceiling tiles have been replaced by concrete finishes and solid oak flooring. 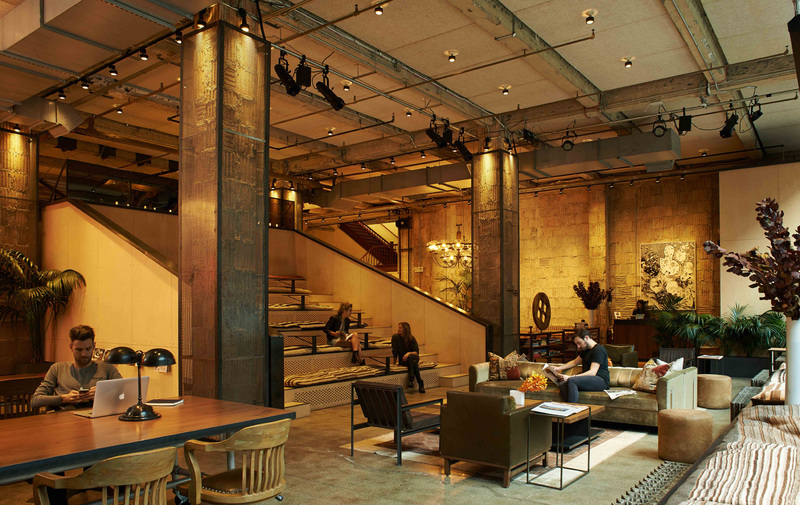 Like at Soho House Berlin, co-working is a casual affair at the Ace Hotel. Its Shoreditch space is a bustling hive of activity, filled with individuals from the nearby creative industries. The US group is set to open a new hotel back on home turf, in Pittsburgh in late 2015. Expect the city’s creative crew to settle in soon. Built in 1811, Tobacco Dock has had many lives since shutting its doors to the tobacco trade – from a failed luxury shopping mall in the 1990s to a site for raves and even Secret Cinema. Now it’s vying to become the biggest co-working tech hub in Europe. From the end of April, the vaults of the Grade I-listed building will open to workers, promising to put Wapping on the map as a new centre for innovation. Meanwhile, Tobacco Dock’s upper floors will continue to host events ranging from Feast food fair to the London Tattoo Convention. On the more compact side of the scale, St Oberholz in Berlin typifies co-working’s coffee-shop genesis. Evolved from the bustling cafe found on its ground floor, it claims to be the city’s first co-working hub and has spread up through the building. A bureau at the turn of the last century, the space retains many of its original features. Could Second Home help reinvigorate west London’s creative community?